I attended the ELPO Natural Balance clinic in Penrose, CO, where I was fortunate to be mentored by eleven of the best farriers in the world, including Gene Ovnicek. They shared their techniques and specialties with my class and invited us to observe them in their joint research projects. Our studies covered anatomy and foot function following the NB Hoof Mapping Protocol that Gene developed by studying wild horse hooves. Above all, there is nothing like having a master put his hand over yours to demonstrate the correct stroke of a rasp or path of a hoof knife. 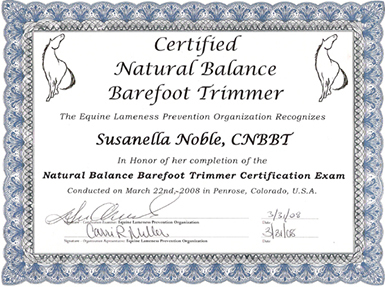 They gave me the physical techniques and mental tools to successfully trim and rehabilitate deformed hooves into healthy, functional feet. I continue to study every day and find invaluable information in the works of Dr. Robert Bowker, Pete Ramey, Dr. Tomas Teskey, Dr. James Rooney, Martha Olivo, Marjorie Smith, Dr. Chris Pollett and Dr. Hiltrud Strasser. The Horse's Hoof newsletter and the Welz's Hoof Help Online continue to be my best resources. The success of my practice can be measured by the healthy, solid hoof capsules on my patients and many laminitic horses who have been returned to soundness. I have taught many owners to maintain their own horses and offer an internship program. If it wasn't for Susanella, my horse would be pushing up daisies! -- J.R. Your work is impeccable. -- S.L. Susanella was my last hope for my mare with chronic laminitis. The professionals I had just weren't making her better and I was ready to put her to sleep. With just a rasp and a knife, Susanella shaped her hooves and kept her in a series of casts for four months. My mare has been completely barefoot now for two years and getting better every day! -- M.C. I rescued three starving horses with horrible hooves that the knackers didn't want. Today they gallop around my pasture on wings thanks to Susanella! -- H.C. The old fashioned way wasn't working! My horse had been going downhill for years. Susanella was my last hope. I watched a miracle take place as she got him out of pain and in casts. He's now trotting and I believe I'll get to ride him again! -- A.D.
My mare was so lame from farriers who over-corrected her pigeon-toes that she couldn't walk.. Susanella pulled her shoes, trimmed her hooves and I was riding again in two months. -- T.T. I always thought that my horses had to wear shoes because of the rocks and our wet climate. Susanella taught me to trim their feet myself and they run on the rocks barefoot -- J.C.
My ponies' feet were split and they hobbled along on the rocks. Today their hooves are so perfect they look artificial. -- D.P. When Susanella gets to the Pearly Gates, there will be a thunder of hooves running to greet her! -- S.B.